Shopping online is becoming more and more popular, and a lot of consumers also go online to learn more about products and services. In order to be succesful, companies have to adapt to the changes in consumer behaviour. Many companies already operate both online and offline, thus creating new contact points for consumers. Online marketing offers a wide variety of possibilities to satisfy customer needs, as the advancing technology allows for numerous ways of customer orientation. However, these possibilities are seldom used to their full potential. There are three important steps to convincing customers to grab onto an online offer and creating a positive customer experience. The online services cannot reach their full potential if they are not tailored to the users' needs. The visitor demands for websites are becoming more numerous. The technical foundation of the website creates the base, upon which the content can be individualized further for each user. The website should always load in a few seconds or even less, both on desktop and mobile devices. A slowly loading site will easily frustrate the customers and they will turn to other sites and brands. Customers demand information immediately and on all devices available to them. Companies have only a few seconds to gain the attention of the customer. In this short time-span everything must work perfectly, otherwise the customer will turn elsewhere. 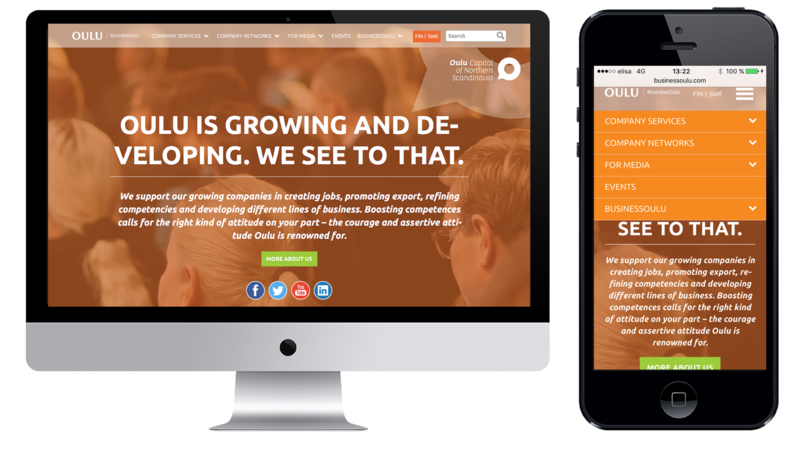 Mobile sites must be optimized, so that customers can use all important functions smoothly on mobile devices as well. This is almost too obvious to be mentioned: the user should be able to navigate the website and find the desired content as effortlessly as possible. A search function can be very helpful for this. The goal must be to connect the users to the right contents in a fast and simple way. Business Oulu has an integrated a search function next to the main menu. On mobile devices the menu can be accessed with a button. Every site should have a clear goal. Which actions are desired from the visitors? When the aim of the website is clear, the company can lead the user to the destination with the right kind of content and visually appealing buttons. Potential customers rarely have the patience to search for contact information for a long time. If the contact information isn't easily and quickly available, it creates a bad impression of the company. If the customer would like to send a contact request, receive a demo of the product or subscribe to the newsletter, there needs to be a clear call to action and a simple contact form. The website should be easy to read both for visitors and search engines. Headlines, metadata and keywords help search engines scan the site and show it to the right kind of searchers. Succinct texts, keywords, short paragraphs and charts and images help keep the customer’s focus, and also signal to search engines that this website has professionally created content. Combining analytics software like Google Analytics with the website can provide valuable data of website visitors. What are the visitors interested in, and what actions have they performed on the website? How did they find the website? This data can be used to lead the customer to the next phase of the customer path. The goal of many companies today is to create a seamless customer experience, where all channels communicate with each other effectively. After all contact points between the customer and the company have been identified, the data from different sources can be combined to create a natural customer experience. Customer service is one of the most important factors in creating a positive customer experience. All personnel involved in customer management must always be able to access all essential data so that the best customer service can be offered at all times. Companies have discovered that a live chat integration with a real person improves website conversion, as potential customers are offered an easy way to ask questions without having to call or wait for an answer via email. 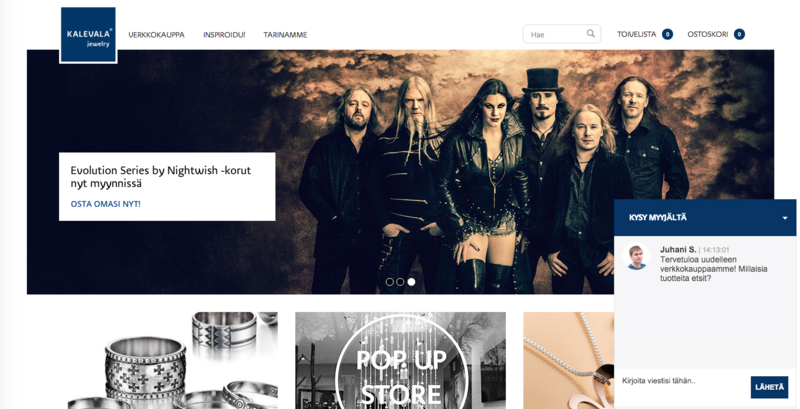 Kalevala Koru offers their customers real-time support via a live chat integration on their website. Integrating social media content with the website offers customers another contact point through which they can reach the company quickly. Asking companies questions via social media has become quite common. A quick and professional reaction proves that the company cares about their customers and is a trustworthy partner. A lot of customers prefer to try and solve their problems by themselves before contacting customer service or the help desk. Customers feel confident, when the company provides them with, for example, an FAQ or a support site where they can check if they could solve their problem without outside help. Companies should ask customers, potential customers and website visitors to leave feedback. Feedback can be gathered via phone, email, a feedback form or a quick survey on the website. This provides valuable data, which can be used to improve the products, services and website of the company. 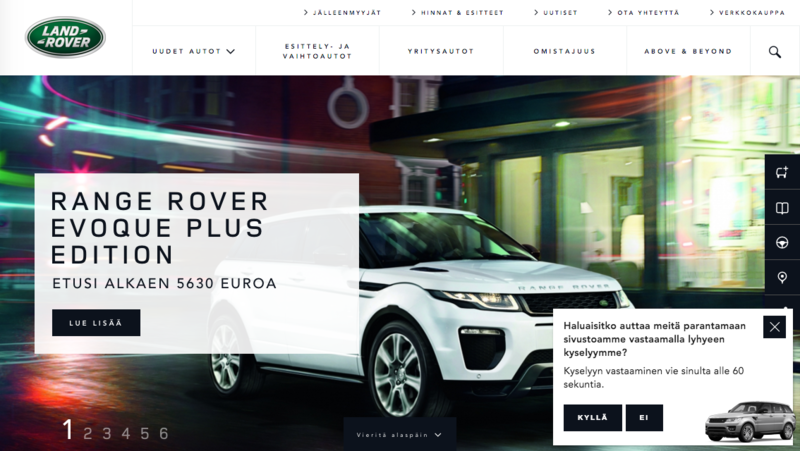 Land Rover asks their visitors to answer a quick survey that takes no longer than 60 seconds to fill out to further improve their website. When a potential customer is searching for information on a specific product or service their journey often begins in search engines, blogs, portals, forums or social media. Due to this it is important that companies are present in the right places at the right time with high-quality and appealing content. Individual and interactive contents generate the most leads and raise the website's ranking in search engines. Text contents are barely skimmed and pictures are shared and forgotten in less than a second, but a lot of people claim to be very concentrated when watching video content. Introducing products and their features in videos can gain a lot of attention from potential customers. With modern tools videos can be embedded everywhere on the website for maximum visibility. Companies should focus on creating high-quality visual content. They help the users form a good impression of the company and solve problems faster, as absorbing information from visual sources is quicker than from text. Customers appreciate colorful, high-quality photos that show real people in real situatons. Many companies want to convey the feelings their products bring to the online world. Visualizing data makes it more easy to understand, interesting and memorable for the consumer. A configurator can, for example, lead the customer around the store or into the dressing room. Mazda counts on high-quality photos and videos in introducing their products. 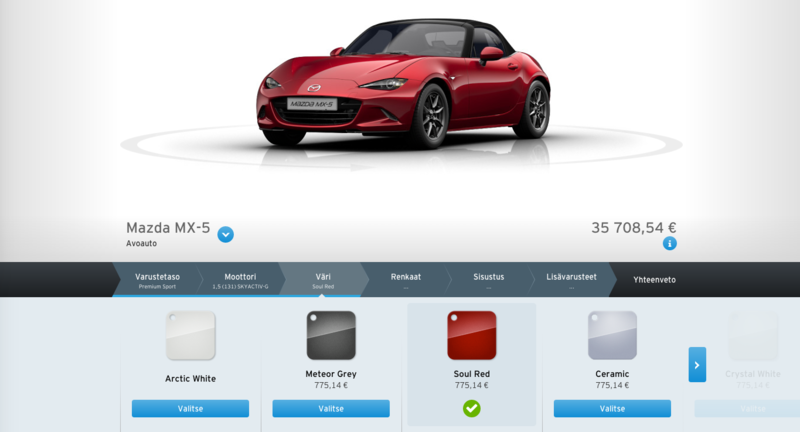 In addition a configurator, with which the customer can build their dream car, was implemented. Content produced by other customers should never be underestimated. People trust the opinions and experiences of other customers many times more than the text produced by the marketing team. A good solution is adding product reviews to the website. With LianaCMS you can easily create interactive websites that succesfully convey the corporate identity of the company. It is constantly developed further to address the challenges and changing situations of the digital world. Contact us or ask for a free demo of LianaCMS. Let's find the best solutions for your digital marketing needs together. hi , you are absolutely rights and your sayings are really awesome and i got some more ideas from it is really nice and very elegant.